The city of Aguas Calientes is also known as Machu Picchu Pueblo due to its proximity to the Wonder of the World. To get to the Inca City from there, you can take a bus or do it on foot. Many tourists decide to leave early to enjoy the sunrise at Machu Picchu. What is the town of Aguas Calientes? What is the distance between Aguas Calientes and Machu Picchu? How to get to Aguas Calientes? How to get from Aguas Calientes to Machu Picchu on foot? How to get from Aguas Calientes to Machu Picchu by bus? Are there other routes to get from Aguas Calientes to Machu Picchu? How is the Hiram Bingham road from Aguas Calientes to Machu Picchu? What are the bus schedules to Machu Picchu? Is it safe to travel by bus to Machu Picchu? Is it safe to travel to Machu Picchu? How much is the bus ticket from Aguas Calientes to Machu Picchu? How often do buses leave for Machu Picchu? Can I walk up to Machu Picchu without the admission ticket? Can I return from Machu Picchu to Aguas Calientes walking? What to take for the walk Aguas Calientes – Machu Picchu? The town of Aguas Calientes is a famous town located at the foot of the mountain where the Incas built Machu Picchu. It is also known as Machu Picchu town. The town of Aguas Calientes is a district of the Urubamba province in Cusco, Peru. It is located at the foot of the Machu Picchu mountain. Due to its proximity to the Inca City, this small town developed various tourist services. Among its main tourist attractions are the thermal baths of Aguas Calientes, the Mandor waterfalls, the Putucusi mountain, the artisan market, among others. From this town the buses depart for the Machu Picchu gate. The town of Aguas Calientes is 9 kilometers away by road. 1) With a train ride from Ollantaytambo (or Cusco) to the Aguas Calientes train station. 2) With a trip by bus and finally by train (or on foot) by the alternative route by Hidroeléctrica to Machu Picchu town. Spend the night in Aguas Calientes to board the first bus is the best way to enjoy the sunrise at Machu Picchu. A trip by bus from Aguas Calientes to Machu Picchu that lasts approximately 30 minutes. A short walk from Aguas Calientes to Machu Picchu with a duration of 2 hours approximately. It is a great idea to go from Aguas Calientes to Machu Picchu walking. The route on foot is by a steep mountain reason why it demands a great physical effort. The first sections are on one side of the road. Then, you climb several steps that cut the slopes of the mountains. The last section continues along the road until you reach the entrance to Machu Picchu. The ticket office of the buses to Machu Picchu is very close to the final train station of Aguas Calientes. From there the buses depart to the Wonder of the World. You can only buy bus tickets by presenting your passport or valid identity document. The trip by bus is short. It lasts approximately 30 minutes. Climb up a high mountain until you reach the entrance gate to the Wonder of the World. The only two valid ways to get to Machu Picchu are by bus or on foot along the Hiram Bingham road. Some tourists look for alternative routes not authorized to enter Machu Picchu illegally. These routes are dangerous. Authorities are authorized to punish visitors who try to illegally reach the Inca Citadel. Going by bus is a great idea if you plan to tour the Huayna Picchu. 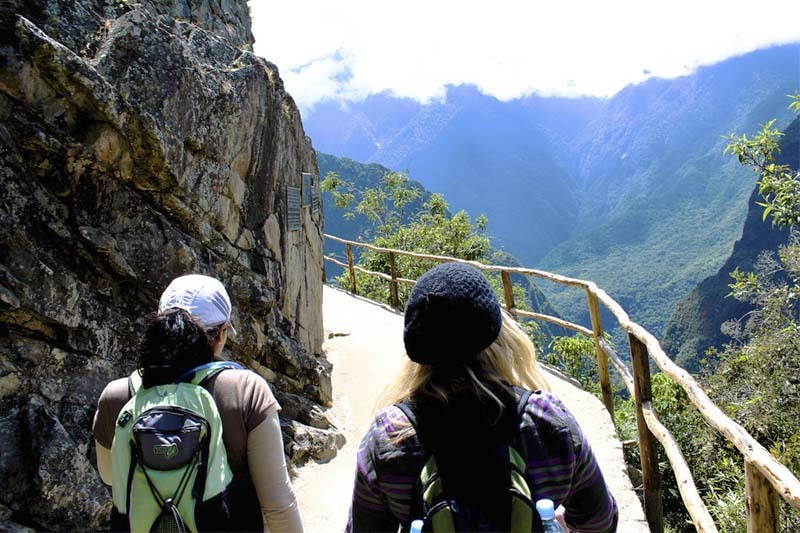 If you are looking to save a little money you can descend to Aguas Calientes by walking. The route from Aguas Calientes to Machu Picchu is a trip down the mountain slopes where Machu Picchu was built hundreds of years ago. Aguas Calientes is at 2,040 meters above sea level, while Machu Picchu is at 2,430 meters above sea level, so in total more than 400 meters are ascended to reach the Wonder of the World. It is the only road traveled by vehicles in Machu Picchu. In the town of Aguas Calientes there are no other vehicles except for tour buses. The buses in charge of the passenger transportation service to Machu Picchu are ecological and safe. They cross the Hiram Bingham road. They are the only ones with the authorization to travel this way. The road to Machu Picchu, with the necessary precautions, is not dangerous. Great attention must be paid to the buses that transit the Hiram Bingham road. During the rainy season (from November to March), it is advisable to wear shoes that are ideal for hiking because the stairs can be slippery. One of the best places to relax after going back and walking from Machu Picchu are the hot springs of Aguas Calientes. The price of the Machu Picchu ‘foreign adult’ round trip bus is $ 24 (US dollars). Children pay $ 12. Check the 2018 fare of bus tickets Aguas Calientes – Machu Picchu. 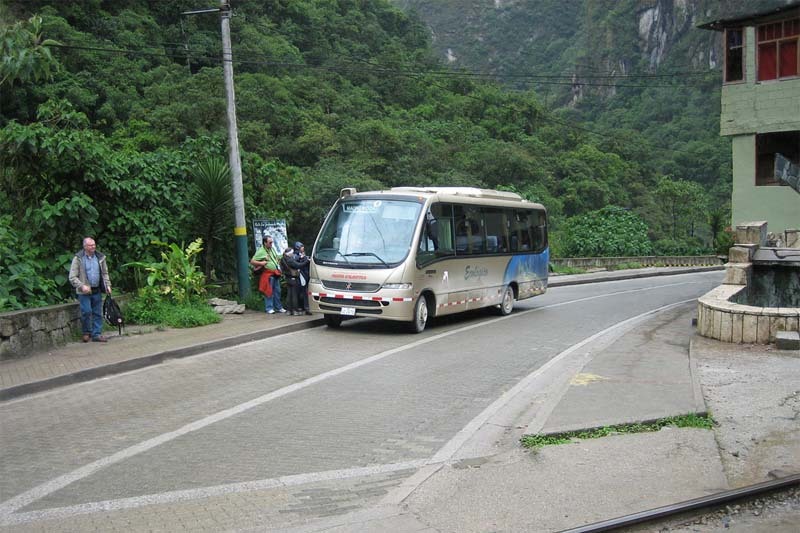 The buses depart every 10 minutes from Aguas Calientes to Machu Picchu and vice versa. In the first hours of the morning, every 5 minutes. No. To walk up to Machu Picchu necessarily requires the entrance ticket to Machu Picchu. Otherwise, they will not allow you to pass through the ‘Puente Ruinas’, 15 minutes into the road. Yes. The favorite option of the adventurers in Machu Picchu is to return to Aguas Calientes walking. The route is simple because it is in descent.